Mango Lassi is a great summer cooler to quench the thirst and also cool your body. I often make Sweet Lassi, Masala Chaas and Mango Lassi during summer for me and my family. All these beverages are cooling in nature and perfect drink to have during summer. 1. Peel the mangoes and chop them properly. 2. Now take a blender and puree the mangoes, cardamom powder and sugar. 3. Add the chilled yogurt and blend it till everything become smooth. 4. 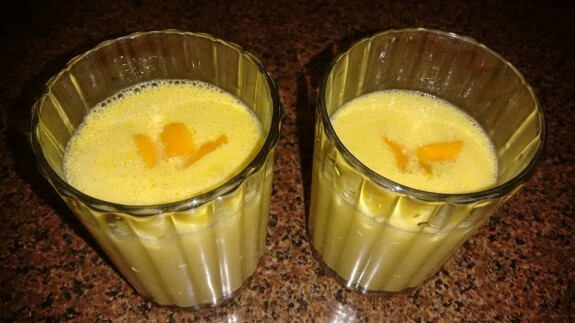 Pour the lassi in a glass and garnish it with mango cubes. 5. You can also add ice cubes to make the lassi chilled. You can add some milk while blending if you want slightly thin consistency.